Quebec sightings - Sasquatch Canada contains current and authoritative information on sasquatch and other homins. The following text was written in august 2009. I will also try to send a drawing of what I saw (different file) along with the text. Coming back to the event, I slowed down driving on the right shoulder of the road and looking on the left through the woods. I let the chasing car passing mine in order to get on the road again and find a place safe enough to make a U-turn. I was driving a 4x4 pulling a trailer. I needed time and space to complete a U-turn. I had to get away from this curve to have enough time to check if a heavy timber carrier truck was behind me. I went about 400 meters to do it, then I was back to the site. On my way back I noticed a small green post indicating 170 km (106 miles) just before the Hydro Quebec sign, (probably the distance from the city of Val d’Or?). I parked the car right at the spot where the « person » disappeared. When I got on the snow bank right away I heard loud branch breaking noises, I guessed 50 yards in the woods. It lasted for about 5 minutes. I needed to find tracks and I decided to proceed step by step. 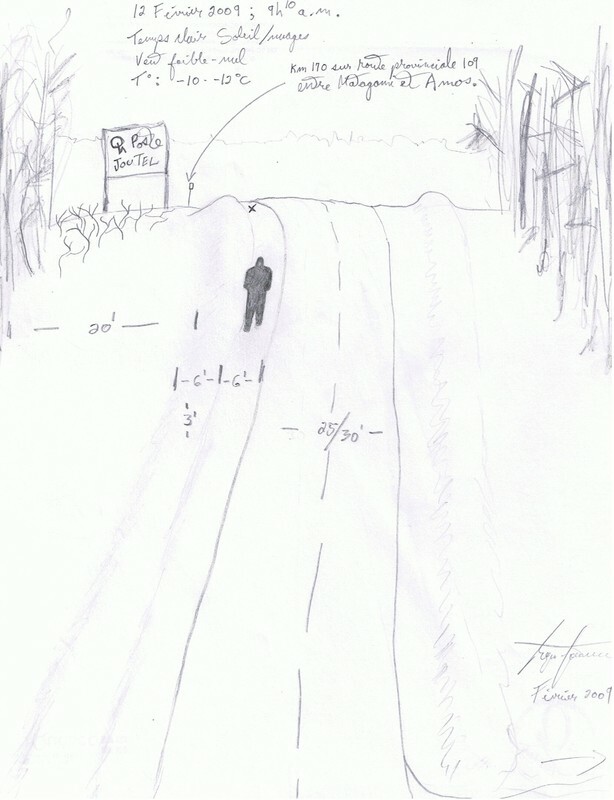 No track could have been made on the shoulder of the road on which the « person » was walking. It was too hard a surface regularly scrapped by snow plower trucks. I walked on and off the bank for 200 yards to check for tracks either on the bank or on the 20 feet clean snow band along the woods. No tracks. I decided then that I had to go in the woods to find the tracks. After I sank in the loose snow I decided to put a warmer coat on and a pair of snowshoes. I covered 200 yards walking 15 feet in the woods along the road. Even equipped that way I happened to sink 2 feet at some places and had a few falls. 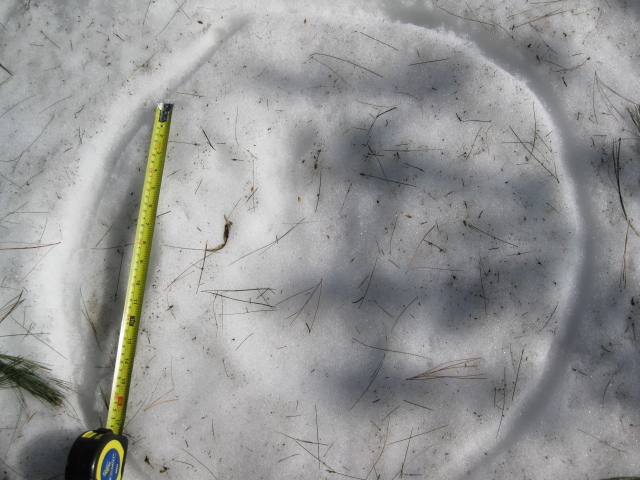 Since heavy snow falls during the last weeks had been followed by milder conditions, packs of snow had been falling from the big trees and had made track like marks on the surface of the snow in the forest. Spotting tracks in those conditions was difficult. I am sure that there where at least one track at the edge of the woods but I could not find it. 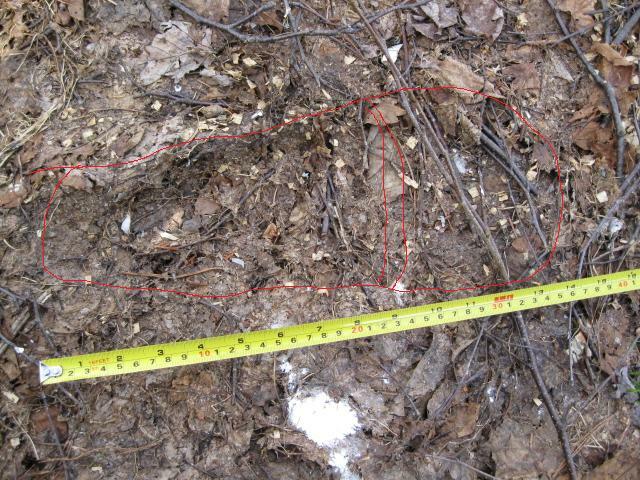 Furthermore I could not expect to find tracks showing exact details of a foot since because of the abundance of snow, the holes left by the legs of a person would get filled with loose snow after the foot left. After having spent an hour and a half on this event I decided to quit. It all began when early one spring I was out raking the grass in my yard. My lot is over an acre and I save myself the gruelling task of cleaning it up after a winter by raking the grass that is exposed as it melts. This makes things easy for me as I only have to do a few feet a day as the snow recedes. For the most part, most of my yard is inaccessible through out the winter because the snow is very deep. So...I'm raking and I get to a large pine tree and as I get under it I notice that the snow has been disturbed and then I see just one big clear handprint under the canopy of the tree... like someone had been hiding under the branches when they were all weighted down by the snow. It makes kind of a shelter. I was completely freaked out, measured the handprint which was overall about 13" by 13". I took photos but not being a professional and using my crappy little camera the detail was not as clear in the photo as it was in person. The detail in the print was quite something. It was not just a flat print. You could see the texture in the palm like where the thumb muscle came down and what looked like calluses at the point where the fingers connect to the hand. You can see in the photo my size eleven boot print to the left of it for scale. 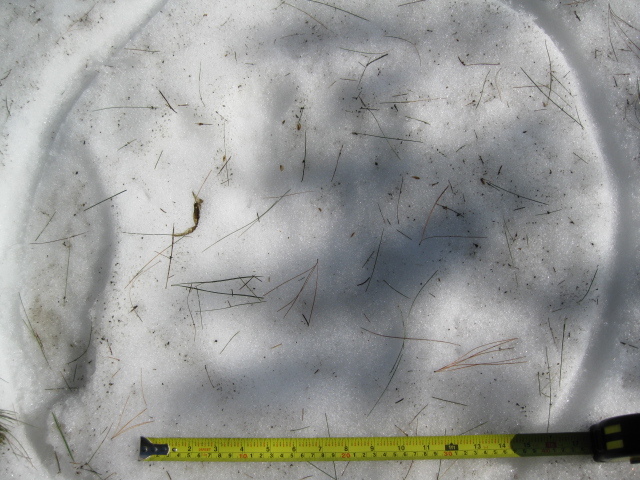 So to make a very long story short the next two years revealed 14" by 6.5" impressions with a stride of between 46 and 54" in various places in my yard and most particularly under the pine tree where I originally found the hand print. One set of prints which we found a little close for comfort was under our kitchen window and have since installed spot lights in this area and this seems to have resolved that issue. For a long time I have questioned why...why my yard? and I think there are different factors involved. We have numerous fruit trees...2 plums, 3 cherries, 3 apples, 1 pear, 2 apricots so snacks are abundant but I think the main reason is it was being used as a crossover point from the woods behind my house to the woods behind my neighbour's house across the street. This is just my theory of course. Candy, quite frankly so much as happened here that it is hard to put it all in an email without it becoming exhaustively long. We've had eye shine more than once, we have heard this moaning/howling on several occasions coming from various points and distances. Also at varying times, twice during the late afternoon and 5 or 6 times at night. I got lucky one night about two weeks before my wedding (Oct 2010). I went outside for some quiet and brought a small digital recorder to practice my wedding speech when after about half an hour I could hear that moan that sounded far off to the south east of my home. I managed to record it several time times however it is faint as the recorder is designed to be spoken into within arms distance but nonetheless you can hear it. I've heard rock clacking back and forth from two locations in the woods within a few hundred yards of each other during the afternoon. Another oddity is that our yard, since we have moved here has been regularly visitied by deer and even often twice a day early morning and early evening. You know, during that two year period we did not see them once. Not even one. We've had occasions where in the night one of our cats would just jump up out of a deep sleep growling and run away. Our two small dogs would bark at something in the woods in the night when we would bring them out. On one occasion at dusk we saw something dark (colour was a mix of grey, brown and black) and tall moving behind a row of spruce trees in our back yard. I grabbed a flashlight ran out behind the spruce trees but whatever it was was gone. Seen large unidentified piles of poop often near the apple tree. Anyway all of this occurrences were all topped off by the sighting which I will never forget to my dying day. I was out in the front of my house around 10 or 11pm having a cigar and enjoying the quiet before heading up to bed when I heard something that drew my attention to my neighbours yard across the street. There was a sound like someone quietly muttering to themselves and the tone for lack of better comparison sounded a little like Marge Simpson. I know that sounds funny but I'm serious after all this time that's the closest comparison I can give you. It was gruff but feminine sounding in pitch and quiet. As if it was talking itself trying to work something out. That was the only sound and then I saw it. It crossed over from my neighbours yard, crossed the road and then crossed the western portion of my property diagonally and then through the back of my next door neighbour's yard into the woods. There were a few things that were remarkable and even surprising to me as it crossed. When I first saw the figure coming into view my first thought was that it was the neighbour and I stepped off the front step and took a few steps in that direction. It was then I realized it was not the neighbour nor was it human. It was always my thinking that if I actually ever saw it my first reaction would be fear and that I would immediately run for cover when in reality there was absolutely no fear. None whatsoever that was surprise number one. Number two, I always imagined the hair being dull and shaggy like you see in tv and books. It was quite the contrary. The hair was long and glistened. To this day I don't know if its hair was wet but ...and here goes another funny comparison, it looked like a giant "cousin it" from the adams family. The glistening hair was not at all what I expected. It was between 7 and 8 feet tall, no distinguishable neck from my perspective and as it crossed my lot I could see it from the side. The other thing that really hit me was the size of its shoulder. It was at least as big as my hip and very muscular looking. All the while it crossed over without making a sound. Not a twig snap, not rustling the grass, nothing. Almost as if it floated through. All this happened in the space of about 15 seconds although reliving it, it seemed much longer. When it disappeared from view in the darkness I ran in the house got my camera and started snapping blindly in the dark with the flash on hoping to get something but no luck. I think that the camera may have been a mistake, or not, depending on your point of view, because after that I never saw it again. Since then I've found only one more foot impression early last spring. We did hear the moan from far off last fall and it sounded like it was coming from north east of here and oh ironically the deer have come back. My thinking is that it (or they) have moved on. I guess time will tell. I've attached one of the recordings. I have two more somewhere taken that same night. You will have to excuse the quality and will more than likely have to wear headphones or if you have software to filter out background noise even better. This was taken in late September 2010 somewhere around 10 pm. It had been raining and you hear the odd car pass on the wet pavement. I'll see if I can find the others for you. I also included one photo of a foot print which I've tried to outline in red where the print appears.